It seems as though, increasingly, I’m greeted with an overflow of complaints when I sign onto Facebook. I know that I certainly do my share of complaining, but I’m not referring to complaints about children who won’t go to sleep or the stomach bug that’s made rounds through someone’s family three times. I’m talking about bigger societal complaints. The kind that border on (and sometimes cross into) outrage. The posts run the gamut from anger over the hiring of a school superintendent to hot, finger-pointing commentary on the racial issues we still deal with today. People should certainly be able to air their grievances when they perceive something going wrong in place and culture in which they live, but if a person has made five status updates in a row listing newly discovered justifications for their (self)righteous indignation, what purpose are they serving? The person is only whipping themselves into further froth, and if there’s no solution or call for discussion and understanding proposed, such “commentary” only poisons the waters even further. Today I’d like to share an example of a freshening of the community waters—Columbia’s Hip-Hop Family Day, presented by Hip-Hop Live in partnership with the Indie Grits Film Festival. At a time when today’s commentary and social media arguments seem laced with racial or racist undertones, there are times when certain aspects of creative culture are attacked or dismissed. Hip-hop has dealt with the smudge of social stigma from the time it began as an underground artistic expression of urban life in the 1970s. Over the past 40-some-odd years, the music and cultural aspects of this genre have evolved into the mainstream, where bolder, more audacious performers and negative imagery tend to attract more attention. Sherard Shekeese Duvall is leading the charge for a day of “Love, Peace, and Hip-Hop” for a third year, calling on families of every background to come together on April 18 from 11 A.M. - 5 P.M. at the 1700 block of Main Street in Columbia, SC. “Our goal is to ensure that hip-hop is represented properly and works as a medium that can unify our community for a day of peace, love and fun,” Duvall writes. In 2013 and 2014 that goal was accomplished and surpassed. Everyone I know who’s taken their brood to Hip-Hop Family Day has had glowing reviews, some even saying that they were surprised by the amount of family bonding that occurred as a result. Once again, this year’s party will feature interactive art exhibits, dancing, and live performances in a family-friendly atmosphere of fun and inclusion. Headliners include Nice & Smooth, Big Gipp of the Goodie Mob, and London-born Monie Love, who was the first British hip-hop artist to be signed to a major label. Last year I’d planned to take the kids downtown and let them go wild at this celebration, but little B went down for an early nap (my attempt to get through the party without a toddler meltdown) that turned into a 5-hour sleep marathon. This year there’s no way we’re missing it (B quit napping this month!). There’s a lot to complain about in the world, but without offering solutions and opportunities for conversation and fellowship, a persons vocal grievances can easily become something for those on the receiving end to dismiss or complain about. Be active instead. When you do so, you actually become an ambassador for a better community. One way you can start is by checking out Hip-Hop Family Day's Kickstarter page and making a donation of $25, $50, $100 or $250 to help make this day of fun and community fellowship a huge success. The organizers are half-way to their goal of raising $5,000 by midnight on April 1. I know Shekeese and the other organizers would certainly appreciate it, and because I want my community to be one that embraces all the good things that diversity brings, I would be pretty appreciative, as well. Considering the invisible status in which many of the world’s girls and women dwell, Keillor’s use of irony is particularly striking. Girls and boys are often trained—consciously and unconsciously—to fill certain roles that were prescribed by male-dominated governance reaching far back into the recesses of ancestral memory. Yet somehow it’s the girls—the ones who have been practicing the complexities of empathy, diplomacy and the perpetuation of social infrastructure—who are most often kept from putting those skills to use in a setting where a large impact is possible. As we celebrated International Women’s Month, the ONE Campaign was thrilled to welcome Chelsea Clinton as a guest and curator on its blog. In her guest post, Clinton shares a report that was put together through a partnership between the Clinton Foundation and the Bill & Melinda Gates Foundation, entitled No Ceilings: The Full Participation Project. The report is an analysis of 20 years’-worth of accumulated data from more than 190 countries, showing us where the status of women and girls has improved, and where more work needs to be done. Around the world, only about 23% of parliamentarians are female, presenting a major problem when it comes to representing a population’s needs and demographics. Globally, women aded 15 - 24 are more at risk of HIV infection than men of the same age. In developing countries, 200 million fewer women have access to the internet (and therefore job listings, competitive pricing of staples and supplies, etc) than men. Between 2005 and 2013, 1 in 4 girls was married before her 18th birthday, violating her basic human rights, robbing her of her childhood, and denying there control over her health, education and future. Two-thirds of the world’s 774 million illiterate citizens are women. Throughout March, Clinton shared some staggering statistics, shined a light upon organizations and partnerships that are actively working to improve the lives of women, and revealed what parts of our own society need some work. Over the next few days I’ll post some snippets here on the blog and on my Twitter and Facebook pages. Keep an eye out, and I hope you’ll find creative ways to take action, whether they’re large and global or small and locally-focused. Stay tuned! *The year 2030 is the goal set by the ONE Campaign, the United Nations, and other global leaders to end extreme poverty. Poverty is Sexist. <-- everything is wrong with this sentence. Get ready to do something about it. I have this backlog in my brain at the moment of all of the things I want to share with you all... from my thoughts on two of the overly-distinct boxes authors must choose between, to yesterday's congregation of political and/or activist luminaries in Selma, Ala. I'm planning on addressing all of these over the next week or two (because, let's face it; if you follow my blogging at all you know that book and essay writing, among other things, have significantly slowed my posting speed!). I don't want to let this beautiful Sunday get away from me without letting you all know about something that's kicking off today. Something BIG. Today - Sunday, March 8, 2015 - is International Women's Day, a global day of recognition shared by developed and developing countries alike. It's meant to honor the achievements of women across the world while also acknowledging how far we still have to go to achieve a universal recognition of women's rights at home and in the workplace. In many countries this has become an official holiday where men honor their mothers, wives, daughters, friends, etc. with flowers and small gifts. The United States is 1 of 9 countries worldwide that doesn't provide for paid maternity leave, leaving low-income mothers who don't have benefits to face some frightening and harmful choices. Women in many countries complete equal or higher levels of education than their male counterparts, but are much less likely to work in executive management or decision-making roles. More than 1 out of 7 women in America lived in poverty in 2013. That's nearly 18 million women struggling to feed and protect themselves and their families. The ONE Campaign, demanding excellence in swift action from world leaders, has been involved with the multinational and well-publicized quest to end extreme poverty by 2030. It only makes sense that a large part of this strategy would involve improving the lives of girls and women through some major activism. Today ONE released an open letter, signed by 35 high-profile women including Lady Gaga, Meryl Steep, Charlize Theron, Lauren Bush Lauren, Beyoncé Knowles-Carter and many more. The letter is addressed to German Chancellor Angela Merkel, who will lead the G7 Summit in Germany in June, and Chairwoman Dlamini-Zuma, who will lead the African Union Summit in July. This letter asks these two female world leaders to use their influence to create and solidify agreements among nations that will finance and create momentum around the empowerment of women and girls, lifting them out of extreme poverty by 2030. The very idea of this fires me up. Women, as grandmothers, mothers, aunts, cousins and daughters, naturally set the tone for a family's success because in most cases they are the ones with the most access to the future, otherwise known as the children. If women are lifted up, everyone is lifted up. 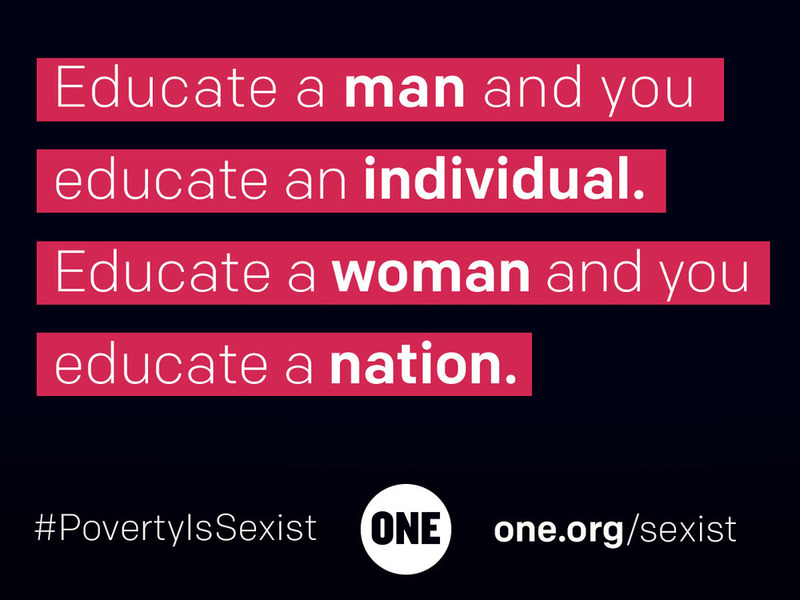 The name of the campaign to rally for girls and women is "Poverty Is Sexist." These are words we don't have to be saying in 15 years. You don't have to be able to bring down the house at the Super Bowl or win Academy Award to get in on this action. ONE is running a petition to go along with the high-profile letter that will also be seen by world leaders. You don't want me to sing into a microphone for a crowd (trust me, but that doesn't mean I won't try! ), but you can bet I signed that petition. You can (and should), too. All you have to do is click here to sign it and also read the letter that will be presented at the G7 and AU summits. What are you still hanging around here for? Thank you all so much for your participation and conversation. Please be sure to take a look at International Justice Mission and the ONE Campaign!